If you have seen Isaac in person then you know ~ he is one of the most complete and impressive alpacas in the American herd. 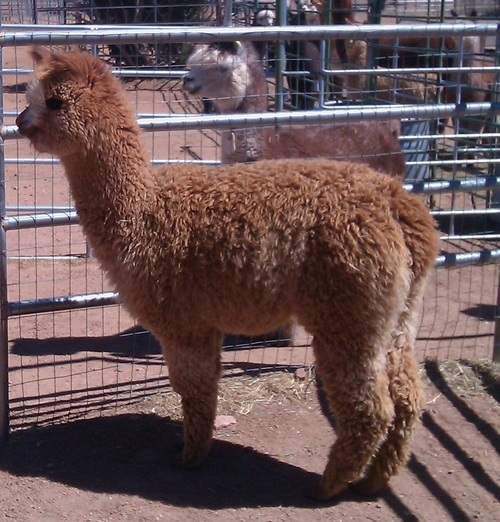 Isaac combines the supreme genetics of Caligula’s Poseidon and Dom Lucillio and he quickly began to make a name for Himself ~ winning eight blue ribbons, a Reserve Color Championship, and seven Color Championships; including the 2005 All American Alpaca Futurity. He combines a dramatically dense, uniform fleece, and an unmatched staple length with spectacular crimp and perfect conformation. He has given us and several farms who have taken the opportunity to breed to him, some magnificent and very consistent offspring. He has consistently produced some beautiful cria with consistent high frequency, low-amplitude fleeces with copious, tiny bundle formation and brightness. He continues to pass on the density and fineness that the Poseidon line has been reliably producing! Rosie G is a wonderful mom Our Rosie has a proven track record and has produced several exceptional babies. She is also very sweet natured and an easy keeper. She is currently bred to GR3 Greazed Lightning, a great young male with fantastic grey genetics. Renaissance brings a lot of interesting qualities to the table. He appears fawn, but when you look close, you find his grey genetics are coming through. We believe he will get greyer as he matures and has the potential to throw grey. Congratulations to Traci and Tony Beauchamp. Tesuque and Renaissance are joining their family and we are all super pleased.